Let me tell you the story of how I got into playing mandolin as a long-time guitar player. I stumbled into the mandolin when I was doing Flashband here in DC. (Flashband is a local project that gets musicians to mix by organizing temporary bands. You do a meet-n-jam with other musicians, then form a single serving band and play a show in about a month). When I showed up to the initial jam session, it was pretty much a sausage fest of guitar players. I mean there must have been six guitar players for every drummer, bass player, and so on. The band I was interested in joining already had two guitarists signed up and they weren’t looking for more. The theme was “Americana Bandstand” with the idea being to re-interpret pop songs in a country / American roots style. So I thought what the hell, I’ll learn to play mandolin. How hard can it be right? I’m writing this as a one week “progress report” after starting the mandolin. Hopefully it will help other guitar players get quickly up to speed. Your right (picking) hand will pretty much automatically know what to do, so you can focus on the new chord shapes and note positions with your left so the learning curve will be pretty fast. The high notes of the mandolin “cut” really nicely through the other instruments in a band and make it great for playing single note melodies, tremolos, etc. It’s a nice change of pace to have a completely different sound palate than guitar. If you have big hands like me, you will have to really squeeze your fingers to get onto the right notes. It takes a while to retrain your fingers for the mandolin’s elf-sized frets and neck. I don’t know if this is just and issue with my mandolin, but the strings are much harder to push down and thus rougher on the fingers (it feels like learning guitar for the first time where your fingers burn and you develop calluses). The mandolin is the modern descendant of a bunch of non-standardized lute-like instruments from the renaissance (wikipedia the full details). Its 8 strings are organized almost like a 12-string guitar, where you have pairs of strings so each time you fret a note or pick a string you are actually playing two notes in unison. And the mandolin is tuned in perfect fifths (G D A E) like a violin, which means that all the chord shapes you learned for guitar will not help with mandolin. I ordered a mandolin online, but it was going to take a while to come and I knew I would need a few consecutive days of practice in order to learn the new chords and note positions. Whenever I’m trying to learn some new musical skill the key is to practice consecutively over a few days – this helps the muscle memory get consolidated so things become automatic. And with our first band practice coming up in a few days I knew I needed to find a way of learning the right chord shapes as soon as possible. So I improvised a training “mandolin” and took the two lower strings off my strat. 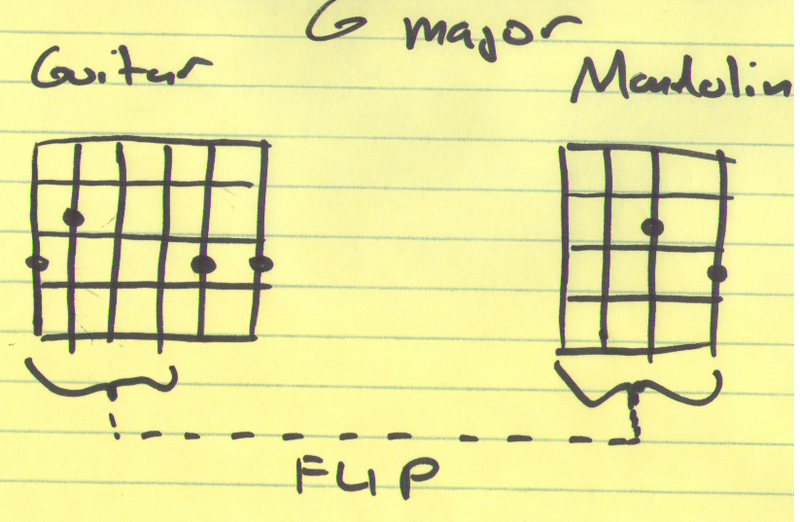 The high E string stays the same, but you tune the others down (way down) to D, G and A. With the strings tuned down so far there was a ton of fret buzz and the tone was horrible, but it was fine for learning the basic chord shapes. The first thing that popped into my head as the ultimate mandolin song was REM’s Losing My Religion. A classic from the golden age of MTV (ie when they actually played music). This would be my mandolin “inspiration song” because it has a mix of single line melodies and uses a good range of the most common chord shapes. 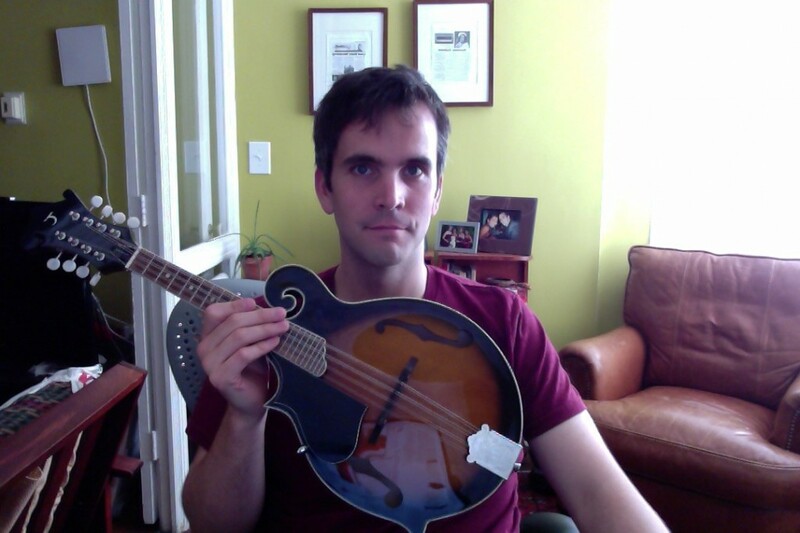 When the mandolin I ordered finally came, I tore into the box and got playing. Making the switch to the actual mandolin was actually a relief because some of the chord shapes were a big stretch on the guitar because of the wider spaces between frets. It took a few tunings for the strings to stabilize and stay in tune but it was nicely set up and plays with good intonation up the neck. I’m happy with the instrument so far. The mandolin I got is from Tanglewood (model TWMX-S-MVSG – catchy name no?) and its an “F-style” mandolin, meaning it has that curlicue on the bass end of the instrument. The action could stand to be a bit lower, so I am going to look at lowering the adjustable bridge and filing the nut down some. Bottom line: this experience has taught me how picking up a new instrument is a great way to get out of a musical rut. If you find yourself playing the same few songs over and over whenever you pick up your guitar, why not pick up the mandolin or a new stringed instrument? PS: If you liked this post you can follow me on twitter here. Confused about which instrument to buy. I am guitarist and want to learn another string instrument. Can’t decide between Mandolin and Banjo. What would you suggest? Mandolin should be easier than Banjo I think, I learned them both and although Banjo takes me more time but I like it more. I picked up a mandolin last fall, I’ve been playing guitar for nearly 20 years (holy cow, am I that old?!). I wish I had known how fun and relatively easy mandolin would be to switch to, I would have picked it up a long time ago. Completely agree with you on the pros and cons. I have pretty gnarly calluses so I was surprised at how much the mandolin hurt my fingers. I had the lower the action quite a bit. And it took a bit of time for my fingers to adjust to what felt like upside down chords. I find myself pulling out the mandolin more than my guitar now just because it’s so much smaller. Easy to take on road trips and great for spontaneous family sing-a-longs. You are right. I hope @WillWard will have a look at this issue and repair the video link so that the reader can get benefits from this post. 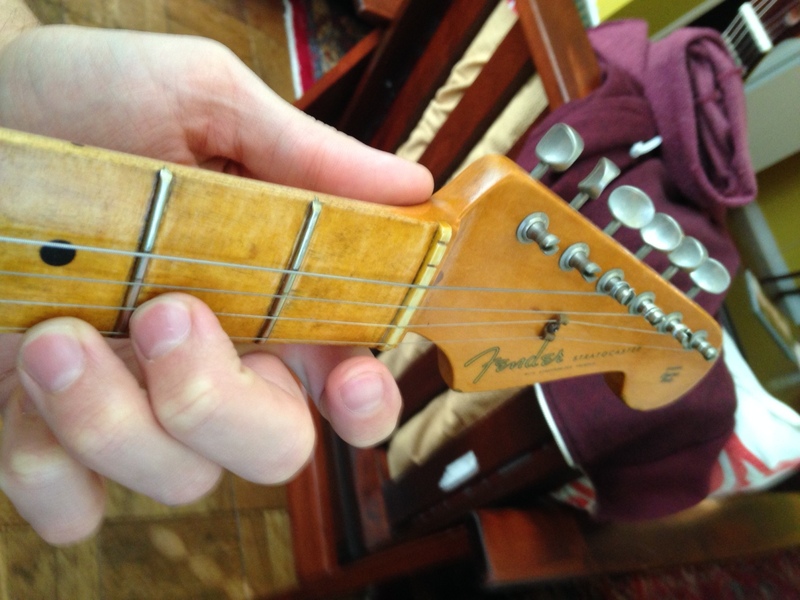 Has any one ever tried stringing one upside down to play it more like a guitar? Came here to ask this question. Inquiring minds want to know. I also was a longtime guitar player who wanted to branch out. I learned a little 5 string banjo which was not hard because I sometimes used open G on guitar. When starting the mando, I noticed how small the frets were so I started by buying a Trinity College mandola. I learned Paradise by John Prine and Million Dollar Bash by Fairport Convention as my first two songs . I later bought a 1940 Gibson A style mandolin got better then traded in both for a great Gibson. I suggest Battle of Evermore as good song to learn in the beginning along with losingmy religion. Good luck to anyone who starts. It’s both harder and easier than you think it will be. I have been playing guitar a very long time and it’s only now, when I’m doing fills, my fingers usually find the notes that are in my head. What is the best way, to not get confused when improvising on a mandolin? The answer to my question might also apply to banjo. As I see it, pianos a singular dimensional (longitudinal), whereas the stringed instrument are two (lat and long). This is further complicated when a different stringed instrument is scaled differently on the latitudinal. I’m making it too hard, right? Great post Will! For folks struggling with finger pain, buy these mando strings immediately! You’ll be MUCH happier! I get them at Amazon.